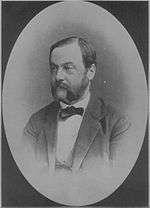 Ernst Ludwig Dümmler (2 January 1830 – 11 September 1902) was a German historian. Ernst Ludwig was born in Berlin, the son of Ferdinand Dümmler (1777–1846), a Berlin bookseller. He studied law, classical philology and history, among other things, at Bonn under Johann Wilhelm Löbell, and in Berlin, where his influences were Leopold von Ranke and Wilhelm Wattenbach. His doctorate dissertation, De Arnulfo Francorum rege (Berlin, 1852), was a notable essay among historians. He entered the faculty at Halle in 1855, and started an historical seminar. In 1858 he became an associate professor, in 1866 full professor. In 1875 he became a member of the revised committee directing the Monumenta Germaniae Historica, himself undertaking the direction of the section "Antiquitates". In 1888 he became president of the central board in Berlin. This was an official recognition of Dümmler's leading position among German historians. His son, Georg Ferdinand Dümmler (1859-1896), was a classical philologist and archaeologist. Piligrim von Passau und das Erzbistum Lorch (1854) – Piligrim of Passau and the Archdiocese of Laureacum. Das Formelbuch des Bischofs Salomo III von Konstanz aus dem neunten Jahrhundert (1857) – Formulary of Bishop Solomon III of Constance from the ninth century. Anselm Der Peripatetiker (1872) – Anselm the Peripatetic. His great work was the Geschichte des ostfrankischen Reiches (Berlin, 1862–1865, 2 volumes; 2nd ed. 1887–1888, in 3 volumes). In conjunction with Wattenbach he completed the Monumenta Alcuiniana (Berlin, 1873), which had been begun by Philipp Jaffé, and with Rudolf Köpke he wrote Kaiser Otto der Grosse (Leipzig, 1876). He edited the anonymous Lorsch riddles twice—first in 1879 and then again two years later in 1881. He also edited the first and second volumes of the "Poetae latini aevi Carolini" for the Monumenta Germaniae historica (Berlin, 1881–84). His son, Ferdinand Dümmler (1859–1896), an archaeologist and philologist, was professor at the University of Basel from 1890 until his death on 15 November 1896, aged 37. ↑ Dümmler, Ernst Ludwig In: Neue Deutsche Biographie (NDB). Band 4, Duncker & Humblot, Berlin 1959, ISBN 3-428-00185-0, S. 161. ↑ Lockett, Leslie (2011-01-01). Anglo-Saxon Psychologies in the Vernacular and Latin Traditions. University of Toronto Press. ISBN 9781442642171. This article incorporates text from a publication now in the public domain: Chisholm, Hugh, ed. (1911). "Dümmler, Ernst Ludwig". Encyclopædia Britannica (11th ed.). Cambridge University Press. This article is issued from Wikipedia - version of the 10/27/2016. The text is available under the Creative Commons Attribution/Share Alike but additional terms may apply for the media files.